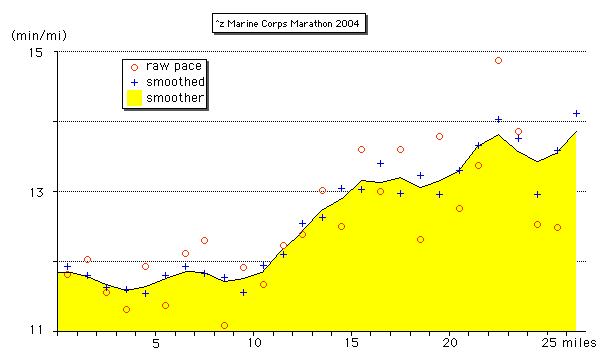 The 2004 Marine Corps Marathon is a struggle for me almost from the start. I cross the finish line after five and a half hours, slower than in any previous marathon. (OK, there was a 26.2 mile solo "Zimmarathon" on 29 Aug 2004 that took me a little over six hours; see HoofTime (31 Aug 2004).) Overall it's a good experience --- but the huge crowds and hypercommercial atmosphere remind me how much more I enjoy low-key local distance running events ... or simply jogging alone through the woods. The weather is the main factor: near-record high temperatures (starting in mid-60's F and rising to upper-70's F) and oppressive humidity until mid-day when a front comes through and brings dryer (but not cooler) air. This is the first marathon in which I think seriously about quitting, beginning at mile 5 (!) and persisting until about mile 20, at which point I figure that I may as well just go on to the finish. I have the pleasure of riding to/from the race and starting with Adam Safir, a runner (and triathlete) who lives only a mile from my home but whom I have heretofore only met electronically (he's a funny and thoughtful person --- see http://www.anstyn.com/ ). About the 6.5 mile mark I realize that I need to cut my pace significantly and start taking walk breaks, so I give Adam my blessings and he goes on to finish ~20 minutes in front of me. At Mile 24 Sharon McNary, a Clif Bar pace group leader, overtakes me. She is attempting, without much luck, to do the mental arithmetic of subtracting 4:59:52 from 5:02:17 --- a feat that may seem less than arduous from the perspective of an armchair observer, but which is in fact rather challenging after you've jogged a few dozen miles in the sun. I help Sharon with the math and we discover that she's more than 2 minutes ahead of schedule for a 5:30 finish time. So 5.5 hours becomes my impromptu goal as well. Sharon is great fun to run with: she sings comic songs, waves a baton in the air bearing multiple balloons, tells silly jokes, shouts encouragement, and chants cadences for those near her to repeat. I tag along until mile marker 26 when my legs request a bonus walk break in recompense for their good work thus far. I grant them their wish, and then "sprint" the final hundred yards to cross the line. No bad spell lasts forever! On Thursday, three days before the race, I walk toward the hotel where race packets (containing numbered bibs, sensor chips, commemorative shirts, etc.) are being distributed. A young lady --- short, somewhat chubby --- is staggering along the sidewalk in the same direction. She suffers, apparently, from muscular dystrophy or some other neuromotor disease. She takes a step, trips, and falls forward onto her hands and knees. I try to help her back to her feet, but she gently brushes me off. "Thank you," she says, "I can make it."